Chris Matthews and Howard Dean on Thursday got into a heated argument about what was included in the controversial video excerpts Andrew Breitbart published at his website last Monday involving former USDA official Shirley Sherrod. 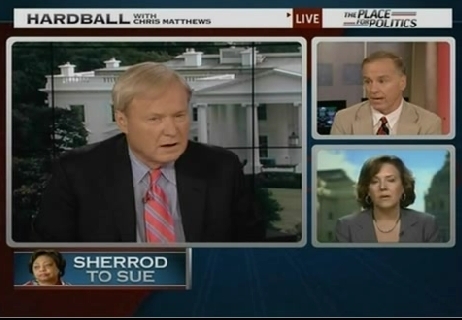 In the opening segment of the 5PM installment of MSNBC's "Hardball," Matthews was discussing with the former Vermont Governor as well as Salon Editor-in-Chief Joan Walsh the announcement that Sherrod intends to sue Breitbart. After playing both videos posted at BigGovernment.com back on July 19, Matthews noted, "That part in there about redemptive revelation was actually in the initial tape." He then asked Dean, "Why do you think if this was a complete slime job, why do you think Breitbart kept that in there?" CHRIS MATTHEWS: Well, there you go. "I opened my eyes. I realized it wasn't about black and white. It was, but it was about other things, about poverty." So, Joan, that part, that part in there about redemptive revelation was actually in the initial tape. JOAN WALSH, SALON: Chris, that little snippet was. But it ends with, "I took him to one of his own." What she goes on to say is one of his own didn't help him. He came back to her. She wound up helping him. She saved his farm. And then she goes on to tell this story, which is a story that I've told and to some extent Governor Dean has told it, too, about the way black and white people in the south were pitted against each other and they were always taught to fight one another when they really had more in common. She goes on to say repeatedly it's about poverty. It's about haves versus have-nots. MATTHEWS: Yeah, but why do you think if this was a complete slime job, why do you think Breitbart kept that in there, Governor? Why did he keep in that part - let me let the Governor in here. Why did he put the redemptive part in here at all? Let's take out Matthews' comment to read the entire statement by Dean: "That's not, I did not see that in the original on the original website or the original Fox..."
DEAN: Well, that's not what I saw on Fox. MATTHEWS: Well, what are you saying? We're not showing the right thing here? MATTHEWS: You're challenging us now. MATTHEWS: You're saying we made this up, that we put it in Breitbart's blog and it wasn't there? DEAN: Now you sound like Chris Wallace. DEAN: What I said was that's not what I saw on Fox. I didn't see that last piece about the redemption shown on Fox. MATTHEWS: Go ahead, Joan. The Governor doesn't believe us now. What do you mean? You're saying we just put something to (inaudible) Breitbart? DEAN: Chris, I don't know what that was. All I know is..
MATTHEWS: You don't know what that was? I'm telling you it was from the Breitbart blog. DEAN: That's not what I saw on Fox. MATTHEWS: Okay, Joan, will you help me out here? I thought Fox picked up -- Fox had further edited the Breitbart blog, I didn't know that. WALSH: Chris, you know what happens in TV, and I'm not going to say this part is malicious. Different versions of the shortened clip were shown. And so, I think that sometimes it had the part about I realized it wasn't about black and white. But the point was why it ended there was it ends with her taking him to one of his own and doesn't go onto tell this, it's a long story. MATTHEWS: Governor, here's the problem, that is what I remember was in the original. That was the original, and I just showed was the original Breitbart blog. DEAN: When I saw the story, that wasn't, the last piece about poor white people wasn't in it. MATTHEWS: Yeah, well it was in the one I saw, that's for sure. MATTHEWS: That's why we had the dispute ten minutes ago, because that's what I saw in the original blog. DEAN: Okay, but that's not what I saw on the network. I didn't see the original blog. Didn't see the original blog? Well, that's not what he said minutes ago, "That's not, I did not see that in the original on the original website or the original Fox..."
DEAN: He may have. He may have. DEAN: Maybe Fox edited it further. MATTHEWS: That's what gets murky here. Okay, thank you Howard Dean, thank you Joan Walsh. The dishonesty on Dean's part was striking and should make any network reconsider having him as a guest to talk on this subject. The video Breitbart posted last Monday did INDEED contain the brief redemption section Matthews quoted, and for Dean to suggest it didn't, or change his story midstream concerning seeing the website, was the height of gall. Moreover, the discussion here was about the merits of Sherrod's case about Breitbart. Yet, Dean just wanted to continue to focus on Fox News. After getting smacked down by Chris Wallace for doing the same thing on "Fox News Sunday," and being shown to be 100 percent wrong in his assertions concerning FNC's role in Sherrod's firing by Bret Baier on Wednesday, the former Vermont Governor was now taken to task for his blatant dishonesty by an MSNBC host. Is even Matthews tiring of Dean's obvious duplicity? Consider that in the 7PM installment of "Hardball," the opening segment was filmed live with Walsh as a guest, but Politico's Ken Vogel was substituted for the former Vermont Governor. Was his abysmal performance two hours earlier at all related to his absence in the later airing? Jeff Poor assisted with the video and transcript in this piece.